Thanks Erin! One year later and our table gets used almost every single day. I know you'll enjoy it! The pdf of your plans, on this site, does not open. 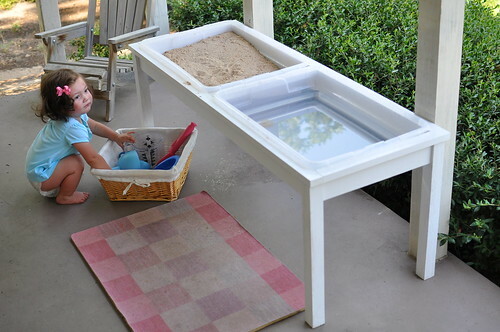 I would love the measurements of the sand table and the bins. What wood did you use and what did you paint it with? Hi Anonymous! You caught it - I was never able to get my project uploaded at Ana White. But the link to the plans I made does work, and they include all the information that would have been on Ana White. Good luck and enjoy! 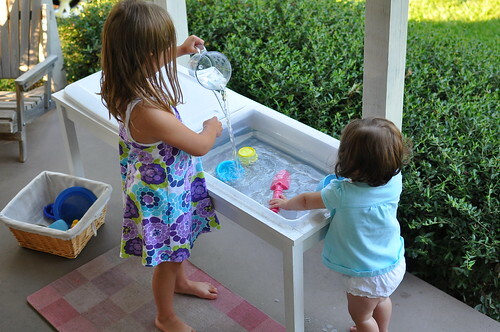 My husband just made me two of these tables for my daycare kids and they are great! The instructions were easy to follow and they look very nice! Thank You! Thank you so much! I am so glad that they are working so well for you. I hope your daycare kids enjoy them! Is there any way to print the plans? Do you need to download through the site where you pay to download it? Thanks. I would love to print these plans as well so we can try to make it for the kids this summer. Is there any way to print them? When I tried it looked like I would have to subscribe to a monthly plan for a fee in order to print it? Thanks - it looks amazing! I tried to print these plans too, but it says I have to pay for a monthly pass to do so. Where can I download them for free like it says on your blog? Thanks for the plans, I have a feeling my son is going to be in heaven if we ever get it built! Thanks, Stephanie! 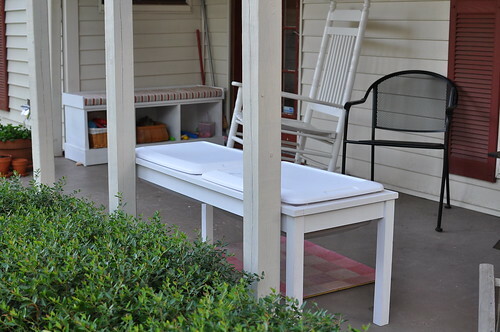 We still love this table, and I hope you and your son will too. I changed the host for the pdf to Google Docs so hopefully there should be no cost or complication with saving and printing now. Please let me know if there are any other problems. I am happy to help. Good luck and happy building! I tried accessing the PDF from google, it was an empty link. Every child in my neighborhood loves this toy. I bought the florist water beads at Wal-Mart, and cheap tongs, funnels, measuring cups, spoons, and plastic tubing from the dollar store and Lowes. You cannot pry children away! If you email the pdf to yourself it will send as an attachment where you print. There is a link to email it on the options. Where did you get the plastic containers? That is what I have struggled with the most in wanting to build my own is finding containers I could use and that would have good lids. Thanks so much for posting your design and writing such clear directions. We made one for our kiddos and they LOVE it (as do all the neighborhood children). 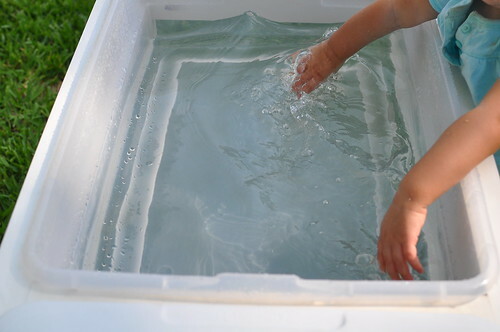 It is so nice to have it flexible too - I am planning on converting to beans and other things in the Fall when it gets too cool for water play outside. We switch between having sand and water bins in there. Thanks for a fun summer toy! I made one for our grandson's second birthday next week. It was my first ever woodshop project. My husband did the cuts, and the calculations, and taught me how to drill, screw, patch, sand and paint it. It was so satisfying! 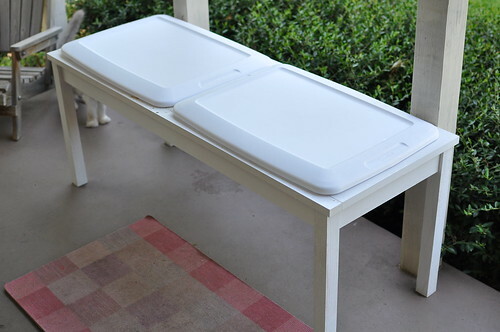 He also made lids that I painted to match, so it can be a flat table, too. Appreciate it, I'm kind of tool stupid and want to make sure I buy the correct things. I am going to start one next week with an old coffee table that is no longer used. I like that it has a shelf on the bottom for more supplies etc... wish me luck! FLsupermom, the $40 Kreg system should work fine as long as you buy a clamp separately to hold it in place. I have the $100 system and love the built in clamp, but I realize its a big investment. The miter box is exactly what I used for years and loved. Anonmous - good luck, have fun and enjoy! Thank you! I made this for my son's first birthday and it turned out beautifully. I love it! The red frame and blue bin look great together. I'm so glad you're enjoying it! Hi Jenny, I love this project! 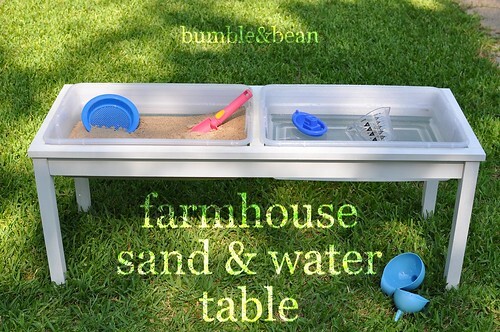 I was wondering if I can feature your sand and water table on my blog (www.jenwoodhouse.com)? May I post one photo with a link back to your post? Did you put any holes in the sand portion for drainage? I'm worried about the kids pouring water into the sand & not having an easy way to drain it...? Hi Jenny, thanks so much for posting this! 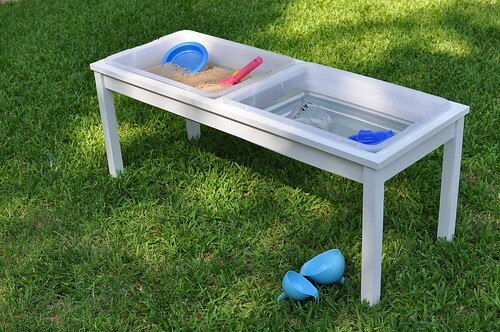 I had looked everywhere for a great sand and water table for my daughter's birthday and stumbled upon yours on Pinterest and knew it was exactly what I was looking for. My husband used your plans and added some extra features on to it. I hope that it is okay, I linked your blog to mine (www.littleslifeandlaughter.com) under our finished product to give credit where it is due! Thanks so much for the amazing idea and plans! Christina, it looks great! The extra wide ledge and storage underneath are great additions. I hope you and your family enjoy it as much as we have enjoyed ours all these years! Thanks for leaving a note. I love seeing these tables! Thank you! I love seeing all of the variations out there too, lots of creativity! We have had ours for nearly two years now and it is something that we use almost every single day! Thank you!